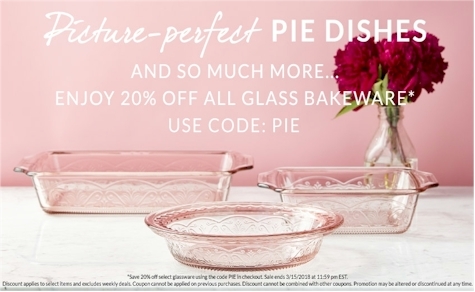 In honor of tomorrow, Pi Day (3.14), today you can get 20% off all glass bakeware (and other select kitchen tools too) at Oneida, when you click here and use the promo code PIE at checkout. Shipping is a flat $7.99 and is FREE for orders $49 and more. Lots of awesome Pesach buys here! The etched glassware pans are just beautiful and very well-priced.